Look up in the sky from the Smidt Welcome Plaza at LACMA this Saturday and you will see something special. 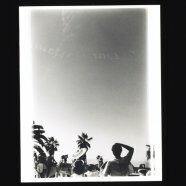 In the 1980s, poet, artist, and critic David Antin (1932–2016) produced two Sky Poems, written by five airplanes flying side by side, using puffs of smoke like an ethereal dot matrix printer. On September 29, the poems will appear again over the Los Angeles County Museum of Art (LACMA) and the Museum of Contem­porary Art, San Diego (MCASD). This event is curated by artist Julien Bismuth in collaboration with LACMA and MCASD. Note: This event is best viewed on the North end of the Smidt Welcome Plaza, near Michael Heizer’s Levitated Mass.